Note: You MUST log-in to the AMHCA website to be able to register for the Conference. If you're not a member, don't worry - just click the "Haven't Joined Yet?" link on the righthand side of the page. Scroll to the bottom of the "Select Your Member Type" page, where you can select the "Guest Account" option. If you ARE a member, once logged in, your membership type will be reflected in the Conference pricing. The General Attendee registration fee includes breakout sessions, keynote speaker, welcome reception, daily breakfast, lunch and scheduled morning and afternoon refreshment breaks. NOTE: The General Attendee package fee does NOT include additional fees related to Pre-Conference workshops, invited tracks and other ticketed special events. Daily Registration fees do NOT include the Welcome Reception or fees for Pre-Conference workshops, invited tracks or ticketed special events. Continental breakfast, lunch and refreshment breaks offered on the day you register are included. Daily Registration fees do NOT include the Welcome Reception or fees for Pre-Conference workshops, invited tracks or ticketed special events. Continental breakfast, lunch and refreshment breaks offered on the day you register are included. WHAT’S INCLUDED IN YOUR FEE: The General Attendee registration fee includes breakout sessions, keynote speaker, welcome reception, daily breakfast, lunch and scheduled morning and afternoon refreshment breaks. NOTE: The General Attendee package fee does NOT include additional fees related to Pre-Conference workshops, invited tracks and other ticketed special events. Daily Registration fees do NOT include the Welcome Reception or fees for Pre-Conference workshops, invited tracks or ticketed special events. Continental breakfast and refreshment breaks offered on the day you register are included. DAILY PACKAGES: Daily packages are available on the day of onsite only. LIMITED AVAILABILITY: Space for Pre-Conference workshops, lunches and invited tracks are limited. Online registrants will choose their workshops when they register. Workshops will be assigned on a first-come, first-served basis and may fill up. REFUND POLICY: Refunds are limited to conference fees paid, and do not include any travel, lodging, transportation, or other fees paid independently of conference registration. Early bird registrations, no-shows and on-site purchases are non-refundable. To qualify for a full refund of standard registration fees paid less a $100 administrative fee, a written cancellation must be received by the Conference Coordinator no later than 11:59 PM EST on May 1, 2019. Absolutely NO refunds will be given after May 1, 2019. Cancellation and refund requests should be sent via email to rgibson@amhca.org. If you registered and are unable to attend, you may transfer your conference fee to membership, diplomate, or any other current AMHCA opportunities. SUBSTITUTIONS: Registrations may be transferred to another conference participant for a fee of $35. Substitution requests must be submitted in writing to mmcshepard@amhca.org. The request must be submitted by the original registrant and include the name and contact information (including email address) of the substitute. The deadline for submitting substitutions is July 1, 2018, 11:59 PM EST. The substitute must qualify for the same rates as the original registration (for example a general attendee cannot be a substitute for a student). 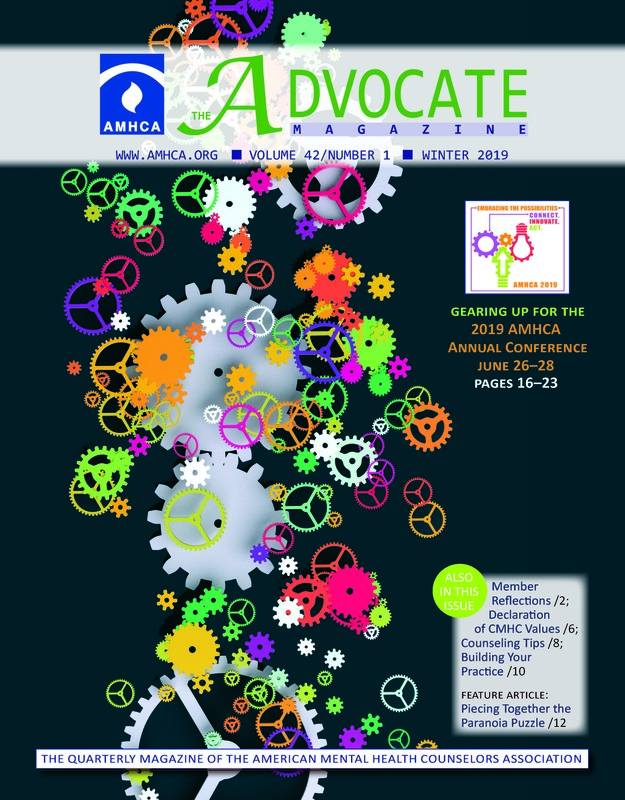 Read more about the conference in our special conference issue of The Advocate Magazine!